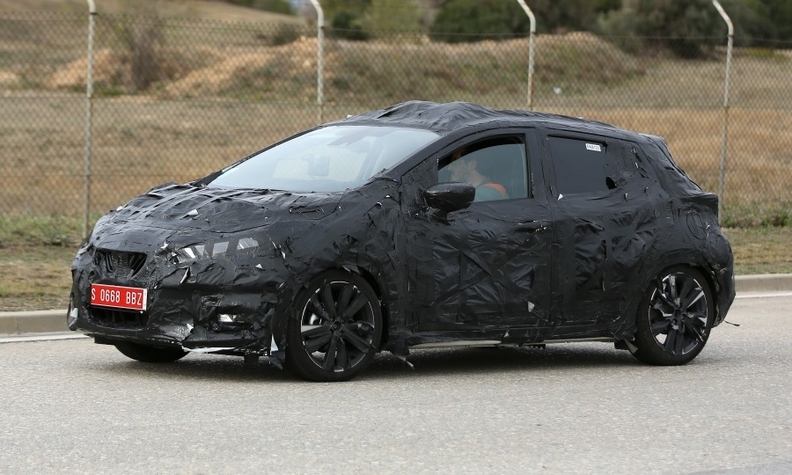 A heavily disguised Nissan Micra is pictured undergoing road tests in southern Europe. The new Nissan Micra will be bigger than the current model to better compete with Europe's best-selling subcompact cars. The latest-generation will grow in terms of dimensions and packaging so it can go up against the Ford Fiesta and Renault Clio in the "heartland of the B-(subcompact) segment," Nissan Europe chief Paul Willcox told Automotive News Europe. He described the current Micra as "sub-B" in size. Willcox said the new car's design will be influenced by the Sway concept unveiled at the 2015 Geneva auto show. The car will feel more upmarket in terms of materials and fit, he said. "We are putting huge efforts into perceived quality. The new Micra needs to deliver a strong message around quality and attractive design," he said. Willcox has previously said the new Micra will have a wider choice of engines without being specific. The Micra currently is available with two versions of a 1.2-liter gasoline engine. The Micra will be built on a mixed platform that has some elements of Renault-Nissan Alliance’s new CMF-B modular architecture, Nissan's head of performance Trevor Mann told Automotive News Europe in December. The first car to use that platform in its entirety will be the next Juke subcompact SUV, which goes into production in 2018 at Nissan's plant in Sunderland, England. Nissan will build European versions of the Micra at Renault's plant in Flins, northwest France, moving current output from Chennai, India. Renault has said it plans annual production capacity for the Micra of 82,000 units. Nissan sold just over 65,114 Micras in Europe last year, up 7.6 percent, according to JATO Dynamics market researchers, placing it at No. 13 in the region's subcompact segment. The Fiesta was the top-seller with a volume of 310,995, a rise of 0.6 percent, just ahead of the second-placed Clio, whose sales were 304,782, up 1.1 percent. The fifth-generation Micra is expected to debut at the Paris auto show in October and will start to go on sale by the end of the year. 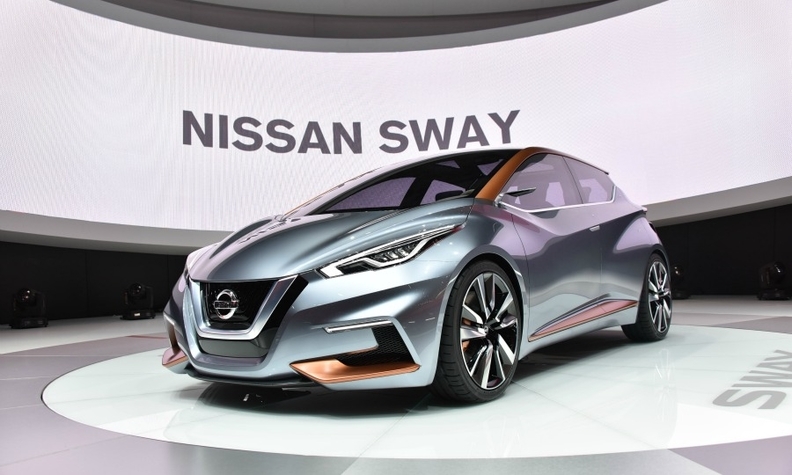 The new Nissan Micra takes design cues from the company's Sway concept, pictured, such as a floating roof design, bold front bumper and a sculpted hood.